For single people they have new reclining seats in premium economy. A good move for an airline that has some of the longest long haul routes in the world. There are seats designed as beds and Pillows for economy passengers. It is the great challenge for the world-weary traveller: how to get a decent night’s sleep on a long-haul flight without paying through the nose for the privilege. After two years locked away in a secret research facility, a team of designers, boat builders and airline executives unveiled a prototype of their solution. The Skycouch is the first lie-flat bed for economy passengers. They hope it will bring a revolution in long-haul travel. It certainly breaks the mould: most of the initiatives of the past 25 years have been limited to business class. From next April, those flying economy from London Heathrow to Auckland on Air New Zealand will be able to put it to the test on the gruelling 26-hour journey. The pioneering design has been developed specifically to cater for young families or older couples on the high-end tourist route. It takes up no more space than a conventional economy seat, so the airline will not lose passenger numbers — although a couple will have to buy a third ticket at half the standard fare to be able to lie together. The bed is activated on rows of three seats, which look like standard economy seating until a button on the armrest is pressed. This raises what looks like an elongated foot rest, which becomes a mattress panel abutting the seat in front. Passengers sleep across the cabin. Two adults can just about lie shoulder to shoulder, but the bed would be more comfortable for an adult and two young children. 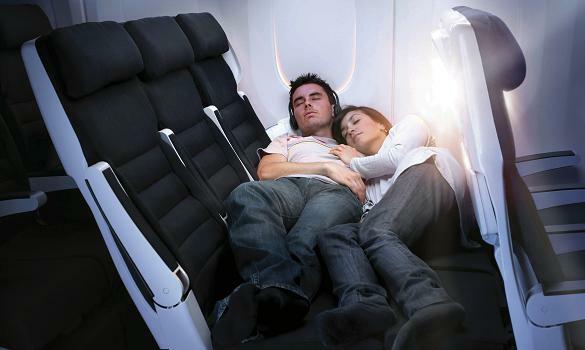 “The days of sitting in economy and yearning to lie down and sleep are gone,” said Rob Fyfe, the chief executive of Air New Zealand, which has spent several million pounds developing the concept. The company is not yet willing to say how much a London-Auckland fare will be, but its long-haul boss, Ed Sims, acknowledged that prices might rise if they proved popular. Such was the secrecy of the programme that simulated flight tests were conducted on actors sworn to silence. Aviation seating is a cut-throat business and Mr Sims expects to license the design to other airlines. His team has also developed a premium economy seat, the Spaceseat, which lets passengers recline. It will be built by Contour seat manufacturers in Cwmbran, near Cardiff. It’s good that this kind of thing is being rolled out to economy class too, just because you’re not in business class doesn’t make the flight any shorter.